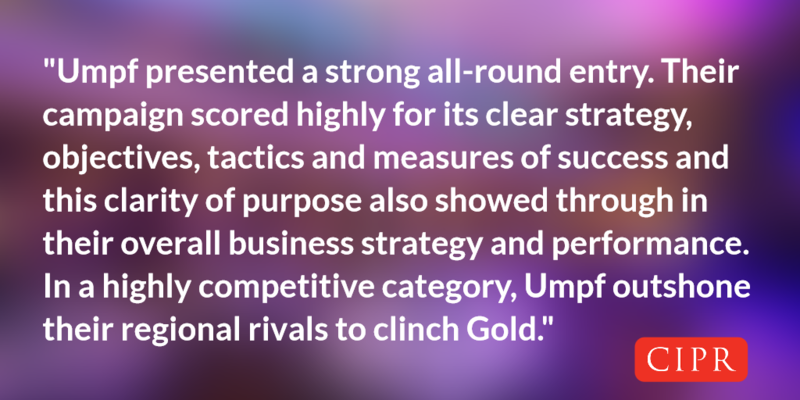 Umpf is a multi award-winning PR agency. Launched in 2009, Umpf was one of the country’s first truly PR and social media agencies, combining creative consumer public relations with social media expertise. See ‘Disciplines’, below. The agency specialises in consumer public relations across traditional and digital channels. From the ink of print media coverage that generates brand awareness and sales to the links of online PR that help SEO and improves your online footprint. The agency has won numerous international, national and regional PR accolades including the CIPR PRide Awards, the CIPR Excellence Awards, the Chartered Institute of Marketing Northern Awards, the AMEC (Association for the Measurement and Evaluation of Communication) Awards. It is recognised as a leading PR agency by PR Week (named as a one of just three agencies ‘On Our Radar’ in its Top 150 PR Agency League Table), CorpComms, PR Moments and Prolific North. The full list of awards Umpf has won can be seen here. Catch up with Umpf’s work in its monthly PR Diary. Umpf delivers clever, creative campaigns across traditional, digital and social media channels. At the heart of what it does, you’ll typically find a brilliant idea. Work that is strategic and measurable so you can see the true return on investment. Executed by people who care about your business. PR professionals who are intelligent, thoughtful and, we hope, fun to work with. Public relations, digital and social media work covers a multitude of disciplines. Listed below are some of the services Umpf provides. Although consumer PR is the cornerstone of our work, we also provide business-to-business PR services. Umpf can assist your company raise awareness, develop understanding and/or change behaviour towards your brand with other businesses, promoting your interests to further your organisational goals. We can help you communicate more effectively with your consumer audience, helping build brand fame through clever, creative campaigns. Campaigns that generate buzz, conversations, interaction and engagement. Campaigns that are strategic and measurable so you can see the true ROI. A PR and social media agency by name, in practice we are a content marketing agency that delivers rich, multimedia content, audience engagement and brand growth. Our content marketing work is founded on our basic principles of delivering clever, creative campaigns; so, clever, creative content and digital experiences that engage audience and builds communities through shareable content. We layer paid media in the social space to amplify our content marketing strategy. So, whether it’s an ongoing campaign tied around specific sales objectives, or an inspirational one-off idea to generate noise online and off, we can give your consumer PR a bit of Umpf. Whether you are in the midst of a crisis and need immediate reactive PR, or you need a contingency plan drawing up should ‘the worst happen’, we can help. We have crisis management experience across a range of sectors and at varying degrees of emergency. Whatever the situation, or potential situation, we can advise you on the best steps to take to manage the media and your reputation. This applies to both traditional and online media reputation management. Whether it’s a smartphone app, a widget, a blog, a microsite or a Facebook application, we have created award-winning campaigns in the digital space. From a simple, one-off idea to raise brand awareness in a particular channel, to a more complicated piece of strategic thinking, we can optimise your brand’s digital potential. Whether you’re looking to launch a new product or service, or celebrate a business milestone, we can organise and manage a successful event or promotion. And we’ll support it, where appropriate, with a media relations campaign to raise awareness beyond just your invitees. You can read more about our Dog Selfie campaign at Crufts, our Lec 70th birthday ice cream sampling campaign, our BBC Good Food Show work and our Super League Grand Final Fanzone at Old Trafford, in our Case Studies section. A highly innovative and creative tactic for your PR campaign. Typically, guerrilla PR involves out-of-the-ordinary, attention-grabbing stunts. Usually unexpected and spontaneous, always memorable – think: water cooler moment. There’s more to the term ‘online PR’ than simply online media coverage. And there’s certainly far more to it from an ROI point of view. If your business benefits from people visiting your website, either because you sell a product or service or because you provide information, then ranking high naturally (ie not paid-for ads) in search engines will benefit your business exponentially. As well as having your website fully optimised for search (SEO), having links to your company on other websites, forums and social networking communities is one of the key tricks to improving both your site’s visibility and its position in search engine rankings. One of the many benefits of online PR is that it naturally creates a link building campaign. Our clever, creative campaigns produce unique content around important keywords, they generate news, start discussion topics, stimulate online debate and build inbound links to your site. For example, the aim of our Made in Britain campaign for Stoves was to promote the brand’s return to 100% British manufacturing – one of the results was raising Stoves’ online visibility. Prior to our campaign, they did not rank in the top 1,000 positions on Google for the term ‘Made in Britain’, during the first two years the campaign ran, they ranked on the first page of Google, between position two and four and they still rank on page 1. Stunts and street activity do pretty much what they say on the tin. Often utilised on an ad hoc basis to promote a specific element of a business or brand, these tactics can effectively focus target audience attention, but tend to have a short shelf life. We realise the value in having a product seen – and used – in the right places. We’re adept at securing product placement in the media that matters – whether that’s a core print title read by your target demographic, through to an influential TV show. We have secured clients products in a wide range of TV shows including, Big Brother, Celebrity Big Brother, Cowboy Builders, Double Your House For Half The Money, Nick Knowles’ Original Features, Vernon Kay’s Home For the Holidays. The boundaries between off-page SEO and online PR are increasingly blurred. Not only do we secure high authority media coverage for our clients, we also understand the importance of authoritative links and SEO friendly web copy. We know how to maximise your coverage to increase online visibility; keeping abreast of the latest Google algorithm updates to optimise your search engine rankings. The most powerful endorsement is that given by our friends, family, colleagues or even people we don’t know. A word-of-mouth recommendation is a grade-A endorsement about your product or service, be it consumer or business focused. The verbal pass-it-on value of a great piece of word-of-mouth PR is priceless. Ditto for that shared, word-of-mouse recommendation online or via social media.